Even as you read this, Earth’s crust is continually being reborn and recycled in a dynamic process that fundamentally shapes our planet. We’re not generally aware of all this action because most of it occurs at the seafloor, under a formidable watery shroud, and often in remote regions of the oceans. The creation and cooling of oceanic crust is the primary means by which heat escapes from Earth’s interior. In this dynamic planet-scale crucible, heat, chemicals, and minerals are transported from Earth’s interior to its surface. Over the long haul, the process ultimately determines Earth’s chemical makeup. It affects the amount of carbon dioxide and water in the crust, oceans, and atmosphere, and it produces zinc, copper, and other mineral deposits, including some gold and silver. So how Earth’s crust forms is more than just an academic question. Several generations of scientists have dredged rock samples from the seafloor, employed submarines and robots to study it, and even drilled into it to learn a considerable amount about the shallow oceanic crust. We’ve analyzed seismic waves that penetrate and reflect off rock layers deep in the crust in an effort to decipher its characteristics—similar to the way physicians use an MRI to peer below the skin. We’ve also studied ophiolites—isolated portions of the seafloor that tectonic forces have thrust up and exposed on continental margins. From early studies, a simple picture emerged: It seemed the ocean crust was relatively homogenous in composition, structure, and thickness—sort of a geological three-layer cake about 6 to 7 kilometers (3.7 to 4.3 miles) thick. On top was lava that spilled out and cooled rapidly into a glassy substance called basalt, which carpeted the ocean bottom. Below were great, vertical sheets of molten rock called dikes—the pathways by which magma was injected to the surface from deeper layers. Finally, lying atop the mantle itself, was a lower layer composed of magma that rose directly from the mantle, cooled more slowly, and crystallized into a rock known as gabbro. This was a neat picture and a great first step, but nature, like life, usually turns out not to be so simple. And so it is with seafloor crust. The layer cake model began to crumble in the 1980s when scientists began dredging, drilling, and diving around the great transform faults that offset volcanic mid-ocean ridge segments in the Atlantic and Indian Oceans. They gathered new evidence suggesting that the gabbro layer of ocean crust may be missing entirely in some locations and thicker than expected in others. We were learning that ocean crust, forged under different circumstances in different places, could be very different. Surprising discoveries further reshaped our concept of ocean crust after several recent research voyages to the world’s slowest spreading ocean ridges, which are located in remote, largely unexplored regions. 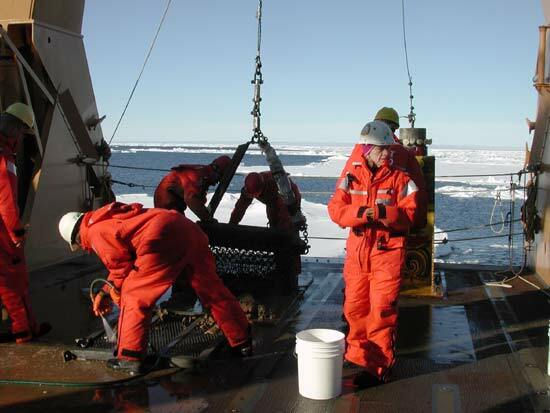 In particular, our work on the Southwest Indian Ridge in December 2000 and January 2001 revealed an area several thousands of miles square where there appeared to be almost no crust at all; rather, the earth’s mantle rises up between the diverging Antarctic and African plates to spread directly onto the seafloor. 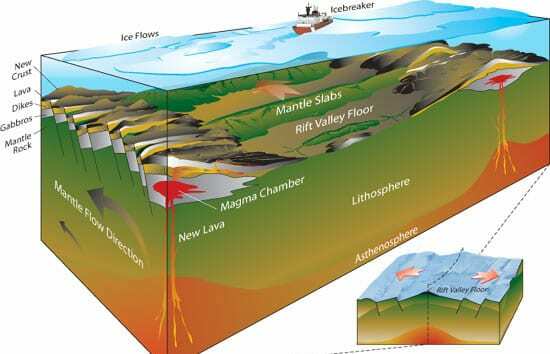 There is no layer cake here—just the “mantle plate” beneath the seafloor. Despite the ultraslow spreading and apparent lack of volcanism, these same cruises discovered areas with massive sulfide deposits of potential economic importance. These deposits are formed by minerals precipitating out of hydrothermal fluids rising out of the crust. This was a complete surprise to those who believed such deposits would only be found at faster-spreading ridges, where magma rose more actively from the mantle. 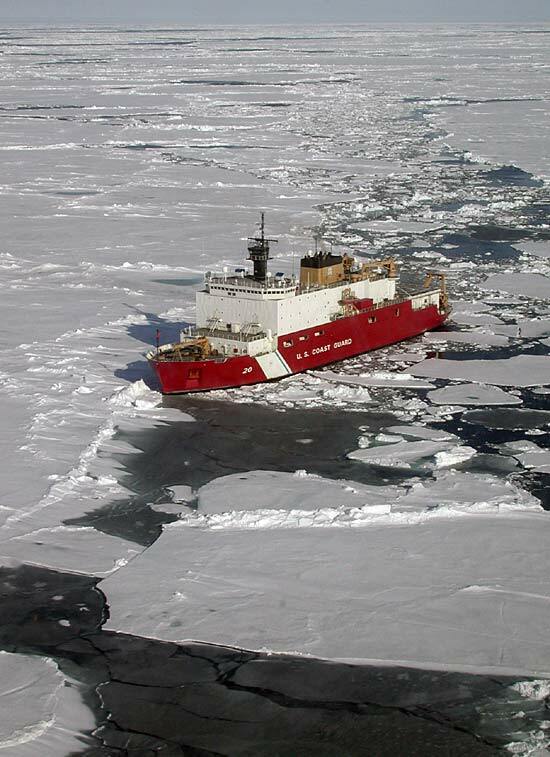 In July 2001, we ventured to the Arctic aboard the new US Coast Guard icebreaker/research vessel Healy. We made the first detailed maps of large portions of the Gakkel Ridge, which extends from north of Greenland almost to Siberia. It is both the deepest ocean ridge, ranging from 3 to 5 kilometers (1.8 to 3 miles) deep, and the slowest spreading, ranging from one inch per year near Greenland to half an inch per year at its eastern end off Siberia. 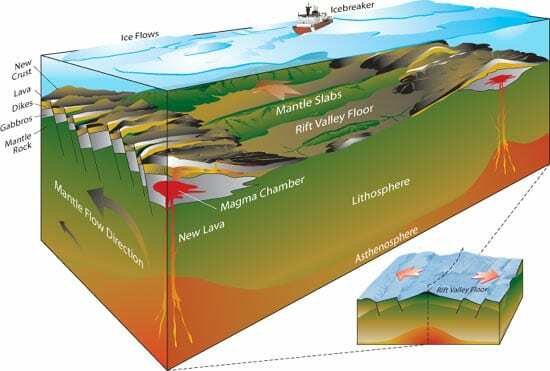 Theory predicted that as seafloor spreading slows along the ridge, volcanism would wither and the ridge would become essentially a crack in the planet where solid mantle rock would be pulled up by the spreading plates to form new seafloor. We did, indeed, find mantle rock rising in great solid slabs to form new seafloor, but we also found that isolated volcanoes persisted as far as we could survey to the east. The generation of magmas in the earth proved far more complicated than anyone imagined! Along the Gakkel Ridge, we not only sampled more hydrothermal deposits, we also detected abundant active hydrothermal venting in a region where current theory predicted their absence. The discovery offers the potential to find vent sites with unique fauna that have evolved in isolation from those in other oceans. These discoveries have now led to the realization that instead of two great classes of ocean ridges—slow and fast—there is a third category, ultraslow, which may make up as much as one-third of the global ocean ridge system. These ultraslow ridges—so unlike the more explored and better known Atlantic and Pacific Ocean ridges—represent a new frontier. From all of this, it is clear that, despite many decades of seafloor study, we have just begun to delineate the varied character of ocean crust. Our recent discoveries resulted from pushing current technologies to their limits, creating new ones, and exploring uncharted territories. The Ocean Drilling Program, for example, recently drilled the first deep hole into the lower ocean crust, in an area where faulting has exposed a deep section of the lower ocean crust and mantle. Cores from this hole, nearly a mile deep, confirm that the composition of the lower ocean crust differs as one goes farther down. But how significant is a single hole? The answer lies in detailed mapping of large areas of the seafloor around this drill site, and at other tectonic windows into the lower ocean crust. Development of new tools and techniques will bring further progress in understanding the modified (or crumbled or perhaps crazy) seafloor layer cake. We are envisioning new, broader approaches to map large areas of seafloor without an expensive ship in constant attendance—easily deployable seafloor rock drills for collecting samples, for example, and the marriage of new instruments with autonomous vehicles, such as the Autonomous Benthic Explorer (ABE). With these approaches, marine geologists will create a series of touchstones at specific sites across the ocean basins. By extrapolating sections in between these touchstone sites with remote geophysical sensing, we will be able to paint a fully detailed picture of the skin that gives Earth its unique complexion. 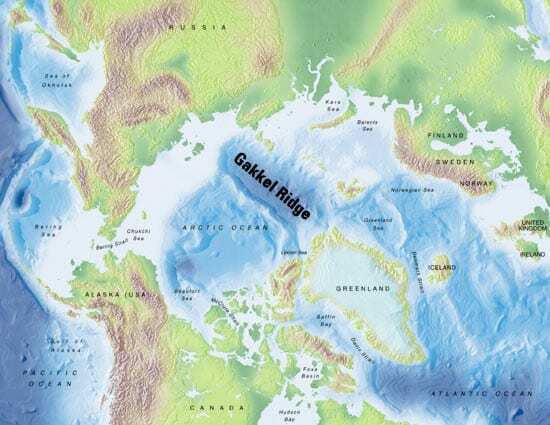 The 2001 AMORE (Arctic Mid-Ocean Ridge Expedition) collected SeaBEAM sonar data to create this detailed 1,000-kilometer (620-mile) bathymetric map of the Gakkel Ridge. » Click here to open a new window displaying a larger image. Volcanic activity at mid-ocean ridges creates new seafloor crust that spreads outward to cover 70 percent of Earth's surface. Recent expeditions have led to the discovery of an entirely new type of mid-ocean ridge. Instead of two classes of ridges—fast-spreading and slow-spreading—there is now a third, ultraslow. Ultraslow-spreading ridges, which may make up one-third of the global ocean ridge system, have distinctive characteristics. Like other mid-ocean ridges, ultraslow ridges have areas where magma rises from the mantle and erupts at the seafloor to create new ocean crust. But in between, there are also amagmatic zones, where solid slabs of mantle rock rise directly to the seafloor. Scientists had predicted that the Gakkel Ridge was spreading far too slowly to promote volcanism, but an expedition in 2001 found surprising evidence for active volcanoes and hydrothermal vents.